Your PT-104 measures temperature using platinum resistance thermometers (PRTs). Both common industry standards (PT100 and PT1000) are supported. The unit is compatible with 2, 3 and 4 wire sensors (4 wire PT100 sensors are recommended for accurate measurements). A wide range of PT100 sensors (see Accessories) are available for use with your PT-104. available (0 to 115 mV and 0 to 2500 mV). For the most accurate measurements use the 0 to 2500 mV range. Your PT-104 is capable of measuring up to 4 channels at once. Need more channels? No problem. 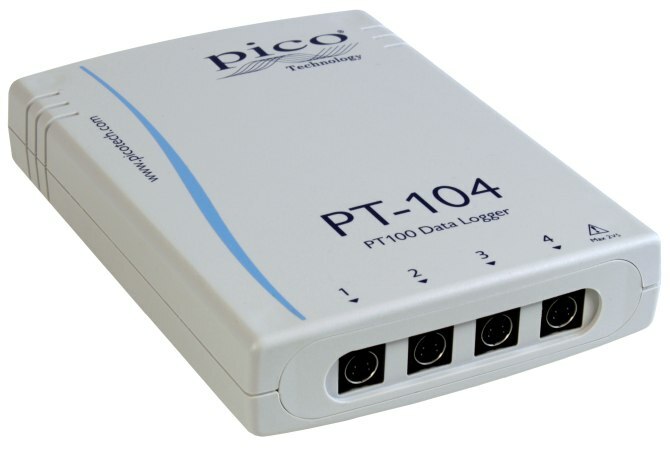 Using PicoLog you can connect up to 4 Pico data loggers to one PC — giving you a potential 16-channel PT100 data logger, or the ability to use your PT-104 logger with other Pico devices such as the PicoLog 1000 multi-channel data logger. All our sensors have been carefully selected to offer high performance at a low cost.